Today marks the 25th anniversary of Ukraine’s independence. After a failed coup in Moscow Ukraine declared its independence from the USSR on this day in 1991. 90% of the population voted for it on December 1 1991. Google has marked the occasion with a blue and yellow logo – the colours of the national flag – and sunflowers, the ubiquitous national flower. I have happy memories of my three visits to Ukraine, twice to Kiev and once to Ivano-Frankivsk for a 3-day wedding! I’ve also been there for the Independence Day celebrations in the square ending in a firework display then a mad dash for the mini-buses as the street cleaners moved in to start the clean-up. Here are a few photographs from Kiev showing the beautiful cathedrals in particular. And BBC staff – could you please stop referring to THE Ukraine. We don’t say THE England or THE France do we. Get it right. It’s as bad as Russia referring to it as Southern Russia. Categories: Politics | Tags: 24 August 1991, former soviet republics, Independence Day, Ukraine, USSR | Permalink. 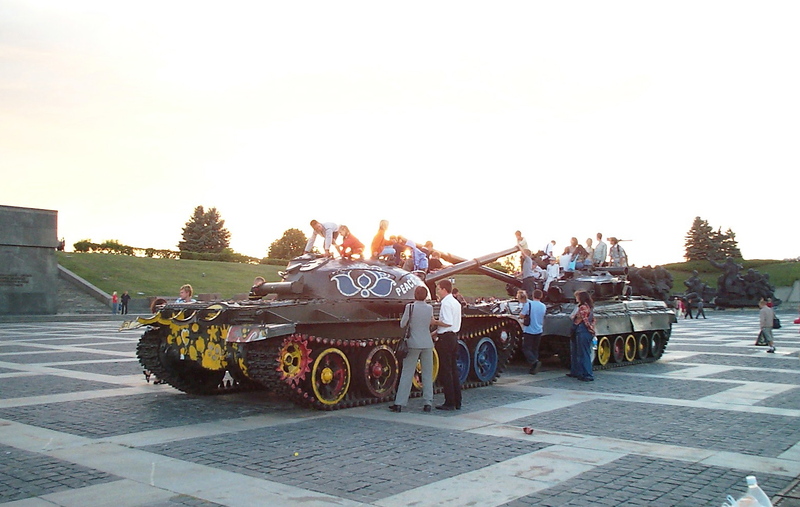 Categories: Recreation | Tags: Kiev, soviet tanks, Ukraine | Permalink. This is straight out of a Victorian adventure story. A successful Welsh steel magnate was invited by the Imperial Russian government to set up a steel mill in Ukraine in 1870 after they’d seen his designs for iron-clad battleships. John Hughes was 54 when he set off with his wife and eight children and 100 steel workers and miners. After an arduous 2,000 mile journey they then had to endure frozen winters and scorching summers as well as cholera epidemics as they created a town in the wilderness. He invested £24,000 of his own money to build a town based on those found in the Welsh valleys complete with teashop, pub, hospital and churches dedicated to St George and St David. The town was called Hughesovka. After the Russian revolution it was renamed Stalino in 1921, removing the link to a foreign entrepreneur. In 1961 it was give its present name Donetsk, home of Shaktar Donetsk football team, football having been introduced by the Brits who went to work in the steel plant. From humble beginnings the city is now the 5th biggest in Ukraine with a population of almost a million. Now, to mark the 200th anniversary of Hughes’s birth in Merthyr Tydfil (he died on a business trip to St Petersburg and his sons ran the business until the communists forced them out) Ukraine is issuing a stamp and running a series of tributes. The Ukrainian ambassador to Britain, Volodomyr Khandogiy, said “John Hughes exported to our country his skills and inspiration. He proved that the technology migrating through political frontiers can bring remarkable changes, modernisation and development”. To close the circle the Welsh Assembly member for Pontypridd is Mick Antoniw whose father came to Britain from Ukraine. Categories: Relationships, Work | Tags: Donetsk, Hughesovka, John Hughes, Merthyr Tydfil, Mick Antoniw, Stalino, steel industry, Ukraine, Volodomyr Khandogiy | Permalink. Still on the Ukrainian theme…. Tours to Chernobyl are becoming increasingly popular, and are a must-do for anyone wanting a completely unique experience. It is, however, crucial to understand the gravity of what happened at the Chernobyl Power Plant and the Soviet Union’s attempts to both clean up, and cover up, the world’s worst nuclear accident. One often overlooked piece of information is that Chernobyl is still inhabited by a few people – against the wishes of the authorities. The name of the completely abandoned, and since ran-sacked city is Pripyat. Though we were told on our visit that everything in Pripyat had been left as it was on the day of the evacuation, there was without a doubt some staging and a liberal use of creative licence around the most commonly visited buildings. Read more on my day trip to Chernobyl and Pripyat here. Categories: Health, Recreation, Work | Tags: Chernobyl, former soviet republics, nuclear reactor, Pripyat, radioactivity, Ukraine | Permalink. Valeria Lukyanova, better known as “real-life Barbie” shocked the world with her cosmetically enhanced plastic-like face which makes her look like a living, breathing Barbie doll. Even more shocking was when fellow Ukrainian, Anastasiya Shpagina, aka Animé Girl, teamed up with real-life Barbie, creating the world’s creepiest photo shoot. Now her friends and family, including her grandparents, are getting in on the creepy action, covering their faces in gaudy makeup and striking rigor mortis-inspired poses. Try to hold back your gasps of horror when viewing these photos of real-life Barbie and her real-life friends and family made up to look like dolls. Categories: Appearance | Tags: Anastasiya Shpagina, anime, Barbie doll, body enhancement, makeup, plastic surgery, Ukraine, Valeria Lukyanova | Permalink.